In her opening prayer, the Rev. Sandy Vogel made the intention of the 43rd annual Legislative Event for Advocacy in Faith, or LEAF, event clear. “We want the very best for all people,” said Vogel, congregational care pastor for Topeka First United Methodist Church, where LEAF took place Feb. 11-12. The theme was “Called to Community,” based on Hebrews 13:1. Through keynote speeches and workshops throughout the two-day event, about 140 women – and a few men – learned about issues facing the Kansas Legislature. Annie McKay, president and CEO of Kansas Action for Children, noted that Kansas has made many progressive moves through the years, including becoming the first state that had a female mayor, the first all-female city council and the first female United States senator who was not succeeding her late husband’s term. McKay said she was concerned with the health, education and economic policies in the state concerning children. Medicaid, which effects 300,000 Kansas kids, McKay said, must be allowed to continue. Kansas Action for Children’s priorities this year, she said, are early childhood programs, strengthening the safety net, an oral health care program and protecting the earned-income tax credit. “In ’17 and ’18, I know there is a lot of ‘ad astra’ left in our lawmakers,” she said. State Sens. Carolyn McGinn, D-Sedgwick, and Vicki Schmidt, D-Topeka, provided a legislative update. Schmidt praised the gathering for their grassroots efforts. 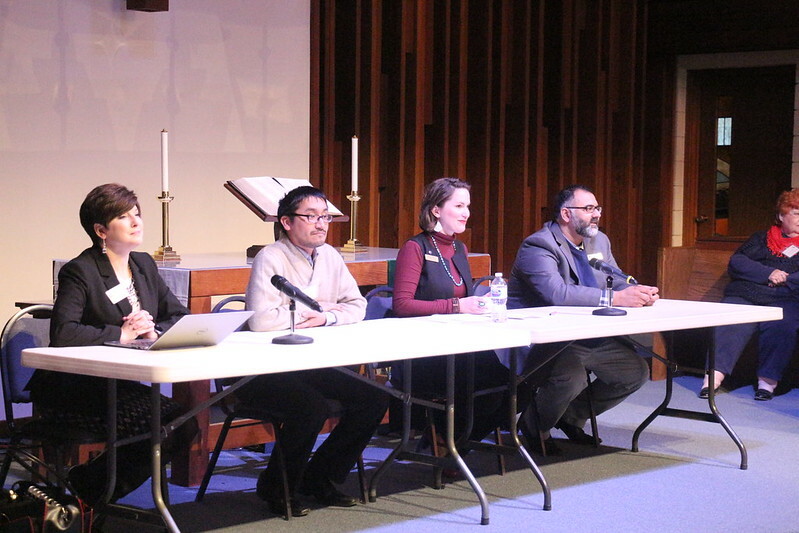 A panel discussion Monday morning included Audrey Dunkel, vice president of financial advocacy for the Kansas Hospital Association; Ahsan Latif, litigation counsel for the Kansas Corporation Commission, who gave an explanation of the Muslim faith; Lalo Munoz, executive director of El Centro of Topeka, an immigrant assistance center; and Becky Plate, a member of the Eudora UMC, who has become involved as a volunteer in numerous social issues. Tex Sample, professor emeritus of church and society at St. Paul School of Theology, railed against corporations that receive millions and, in some cases, billions of dollars in subsidies from the government for new sites for their stores. That money, he said, should be serving individuals and not multibillion-dollar corporations. Sample praised the work of the women at the LEAF gathering and those like them. Monday’s lunch was spent with legislators from the attendees’ respective districts. Thirteen Monday-afternoon workshops included topics such as putting faith into action, building communities for healthy families, encouraging women to run for office, an update on Kansas schools, LGBTQ issues, DACA, Medicaid expansion and citizen participation. LEAF is sponsored by the United Methodist Women of the Great Plains Conference and Church Women United. A similar event that featured Nebraska legislative issues, and sponsored by the same groups, was conducted Feb. 10 in Lincoln.